A Checkweigher is a machine that checks the weight of a package, product, or carton that travels across the load cell of the machine. 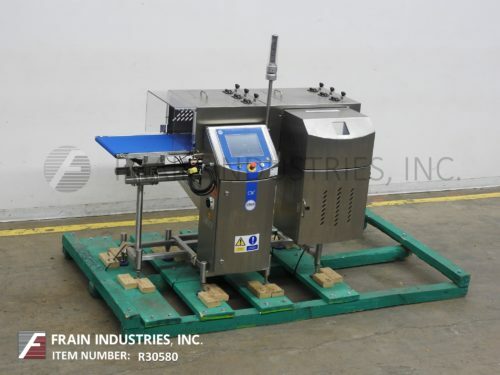 Checkweighers are outfitted with different kinds of product reject devices to prevent underweight and overweight packages from proceeding down line. Checkweighers determine overweight and underweight based on parameter inputs. 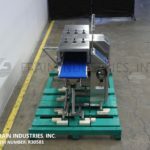 Checkweighers are also used to automatically space filled packages, weight them to check the accuracy of the gross weight, segregate the underweight packages, produce feed-back information for controlling the filling operation and perform a number of other control and record keeping operations. As a general rule, the length of the load cell or weigh cell on the checkweigher should be approximately 1.5 times the length of the package to be weighed. (Technically speaking, the package need only be on the load cell by itself for a fraction of a second, so that a checkweigher with a smaller load cell is suitable for a slower moving line.) Different types of checkweighers are designed for different types of products. Some checkweighers can accurately weigh small tablets in a pharmaceutical house and others may weigh large items that weigh several pounds.